Human history and Natural history are inseparable. We humans are not interlopers on this third rock from the sun. We are not invaders. We are residents… native to Earth. We are here because this is home — because this is the place that spawned us. There is not humanity and Nature. There is simply Nature… and we humans are integral to it. I do not intend for this post to probe the depths of Humanity in Nature. 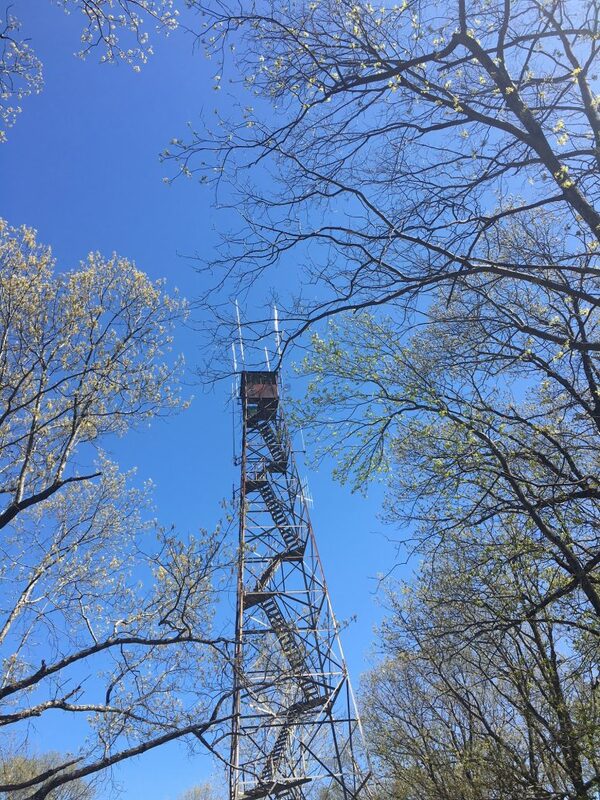 Instead, I chose this esoteric point of entry to set the stage for reflecting on my April 20, 2018 hike at nearby Monte Sano State Park. Not my first Monte Sano sojourn, but my first on these particular trails. All of these trails wend well within the humanity/wildness interface zone. European settlement and influence have marked this not-so-back-country for two centuries. 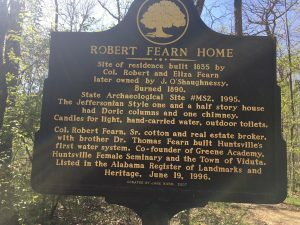 The State Park and adjoining Northern Alabama Land Trust trail system are testament to those who recognized our interdependence with Nature and took measures to protect and preserve wildness within reach of the Huntsville community. In his 1948 Foreword to A Sand County Almanac, Aldo Leopold observed, “There are those who can live without wild things, and some who cannot. 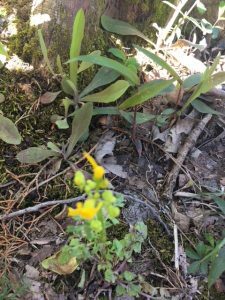 These essays are the delights and dilemmas of one who cannot.” I offer my compliments and appreciation to those who cared (and care) enough to conserve and tend wildness on Monte Sano. Again, we are one with Nature and what better way to remind us than hiking a wild area rich with human history. And do it on a perfect spring morning! We know that Native Americans lived in this region for twelve millennia. They left a far lighter touch on wildness than European settlement has over two short centuries of occupation. 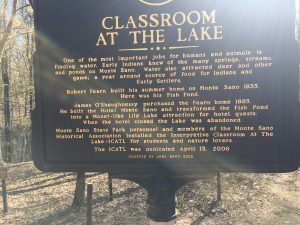 No historic markers designate their dwellings at Monte Sano. Nearly two hundred years ago, Col. Robert Fearn (below left) built a one-and-one-half-story summer home atop Monte Sano at 1,600 feet. 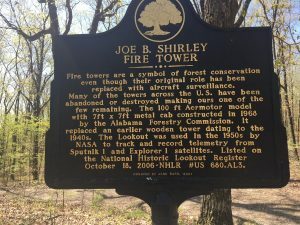 Fire destroyed the structure 55 years later. James O’Shaughnessy (below right) built a two-story Victorian residence nearby in 1890. 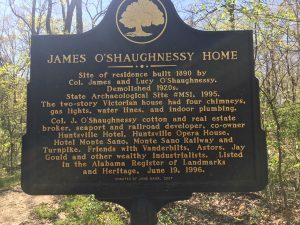 Among other endeavors, he co-owned the Monte Sano Hotel, also nearby atop the plateau. Two homes and associated out-buildings and a full-service hotel. Permanent man-made features on the plateau landscape, right? Not hardly — Nature’s eraser assures that little is permanent. The entire area we hiked is closed forest, appearing to the uninitiated as forest primeval. 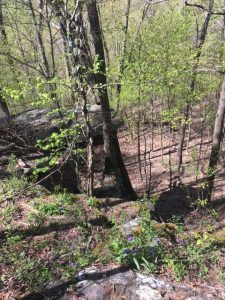 Sure, we saw a couple stone gate posts, a remnant brick cistern liner, and abandoned roads, long-since part of the forest floor. The maturing forest signaled subtle successional changes to me, evidencing that some acreage had been cleared. The heritage sign below stands at what had been a fish pond and then a lily lake at the hotel. The forest, as it has with the abandoned road beds, is reclaiming the pond. Organic debris is transforming the open water to deep, soggy muck. Trees and shrubs are finding purchase. Next step — a vernal pool, then a wet depression. This sign and others memorialize the valiant efforts to domesticate a mountain-top. I enjoy learning more about the region’s human/wild interface. Nature is a single entity to which we are as integral as other living elements. Most of this trek kept us atop the plateau, neither gaining nor losing elevation. Still we tallied 20 species in flower. Had we dropped below the plateau (rim rock and drop below) we would have encountered others. 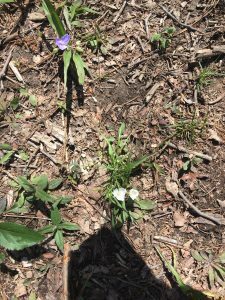 Spiderwort is among my spring favorites. We saw mostly the blue one, along with an occasional white version ( a double below left), even seeing one of each in a single camera frame (below right). The two are variations of the same species. I encountered a first for me. 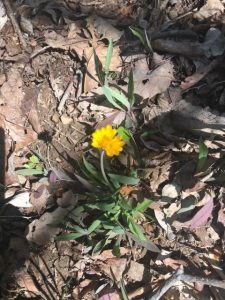 As near as I can tell, below is a potato dandelion (Krigia dandelion). 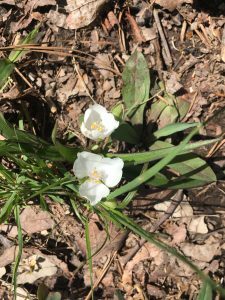 A lovely flower, especially on an otherwise barren forest floor. The strong sunlight reaching it will soon yield to the rapidly filling canopy. Trees will intercept and harvest the sun’s May rays 60-80-feet above our soon-to-be-dormant Krigia. 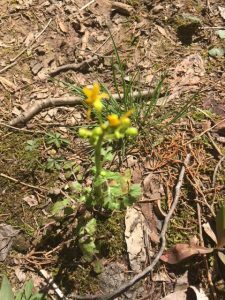 Wood betony or forest lousewort (Pendicularis canadensis) presented another first. Many would consider lousewort a weed in their home garden. Here on the mid-April plateau top I viewed it as a harbinger of a new season of growth and vibrancy. 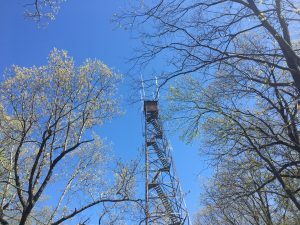 The forest canopy is flexing for another several months of reclaiming its exclusive hold on permanent residency on Monte Sano. I accept a few hours of mid-April woods-hiking as a gift. Spring progresses so quickly; summer approaches at breakneck speed. As of the date I am posting this, the average daily high here in northern Alabama is 79 degrees. We reach peak average daily high mid-July at 91 degrees. We won’t drop to a 79-degree average high until the first week of October. Summers hold sway far longer than where we’ve lived up North! 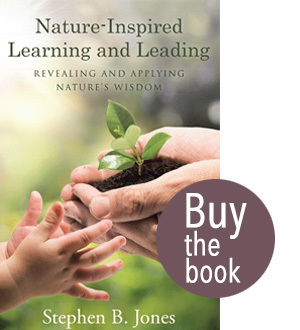 Recording these experiences within the context of Nature-Inspired Learning and Leading forces me to test often my basic proposition: Every lesson for living, learning, serving, and leading is either written indelibly in Nature or is powerfully inspired by Nature. I urge readers to awaken to what is within reach of where you live. Take time to visit. Hike and Look. Look and See. See and Feel. And Feel and Act — to make some small corner of the world better through wisdom, knowledge, and hard work. 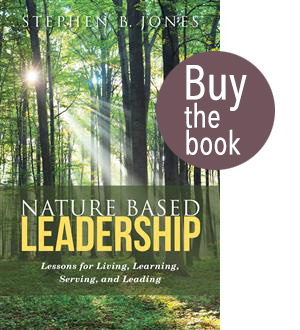 And realize that Nature’s laws apply to living, learning, serving, and leading. To vocation and avocation. To enterprises of all sorts… from family to church to community to business. May Nature Inspire and Inform your Life.